I love, love, love bargains. There’s a great sense of satisfaction when I find an irresistible item at an equally irresistible low price. That’s why I enjoy browsing garage sales, flea markets and thrift shops and why I was delighted to find groups on Facebook like Fat Too and Fat Too Grand where members sell clothing (used and new) in sizes 20 and up. There’s also the annual Big Fat Flea which benefits NOLOSE. It’s happening this year in October at NYU Law School (I’ll post reminders as the date gets closer) and where I’ve scored dresses from IGIGI, SWAK Designs, Domino Dollhouse and more for $10. That’s not a typo. I can’t wait! About 3 months ago I spotted a Pure Energy dress in excellent condition, on Fat Too, for $20 including shipping. 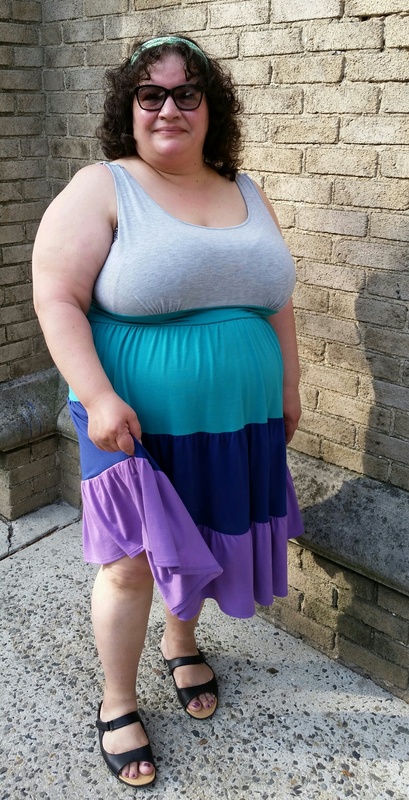 I couldn’t resist the colors nor the price and wore it for the first time today along with a pair of Comfy Cotton Bike Shorts by Re/Dress Online (my go-to shorts for combating summer chub rub) and Corri Mule Sandals by Comfortview® Energy Flex® (told you that I got them in other colors!) Pretty dress and great bargain, right? Speaking of another person’s treasures… tomorrow I’m taking part in a multi-family yard sale. Hopefully my, um, junk will be bargains too good for others to pass up. Have a great weekend!! Love that dress! Super cute with some great colors. Looks super comfy too!